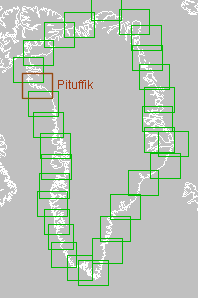 Satellite images from areas along the coasts of Greenland. The images are updated several times a day. The satellite images are delivered by the the University of Dundee, Scotland (the green images) and by NASA's Goddard Space Flight Center. The NOAA images are from DMI's own receiving stations. The Sentinel-1 images are from Europe's new Sentinel-1 satellite processed by DTU. Click on the thumbnail to open the full size image in a new window (~400kb). See also archived Greenland Ice charts made by DMI's Ice service, and Satellite images from Denmark. There are 19870 images in the archive from 21-06-2009 to 19-04-2019. See all, or the latest images. Select date and number of images to be shown up until the selected date. The above function sorts the database to show only a single satellite/instrument. Notice that not all areas contains all image types, and ASAR is no longer updated. Chlorophyl (MERIS) only in Nuuk, Disko and Daneborg, and SST only in Nuuk, Disko, Qaanaaq and Daneborg. Ocean and Ice - Danish Meteorological Institute - Lyngbyvej 100 - 2100 Copenhagen Ø - Denmark.